Seth is on a chair at the sink playing with water and a few dishes. A moment ago I heard him say, "Drink. Ahhhh." I hadn't given him anything to drink. You may recall the last time that happened. Fortunately, this time he hadn't been slurping down children's medicine. No, this time he was drinking from a beer bottle. 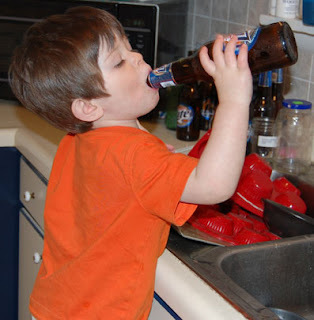 Just to be clear (no need to call Child Protective Services), he had put water into an empty beer bottle. I think you can see Daddy's stash of remaining empties on the counter. Is there an age limit on AA meetings? Imagine my surprise as I peered over to find my two year old swigging down what appeared to be a bottle of beer! Damn that Baby's Daddy for leaving these old bottles lying out on the counter like that... Rest assured, however, that Seth was smart enough to fake Mommy out by filling the bottle with water. I think he's quite the genius, wouldn't you say?? Queue the violins. I just found out that our accountant didn't direct deposit our tax refund. That explains why the money hasn't shown up yet. What's really annoying about the whole thing is that this will delay our stimulus payment. We would've been scheduled to receive a direct deposit by May 16th. Now we're scheduled to have it mailed by July 4th, which is a holiday, so no checks will actually be mailed that day. Oh, poor me. Life is so hard. Wah. I'm sure that Rwandan refugees and Russian orphans really feel sorry for me. Not only am I going to specify direct deposit next year, I'm also going to ask to be the first person on the freaking return. My SSN digits are more favorable than Bob's. In terms of social security numbers, I'm comparable to the kids in the class whose surnames start with C; he's comparable to kids with W surnames. When I open the cupboards, there are clean plates, bowls and cups. When I open the drawers, I find clean silverware. Surely I'm in the wrong house. Warning: The post below describes my horrifying housekeeping habits. Read at your own risk. A few years ago, we bought a dishwasher, and I was so happy that for the next three months, I did the dishwasher dance whenever I thought about it. When we moved into the new house, no dishwasher. Today, almost every dish is dirty. They're heaped up on every counter surface. Last night I gave Seth a drink of milk from a measuring cup. Yes, it's true. Now you know just how bad of a mother I am. I made my child drink from a measuring cup. Sure, my kitchen is not as bad as those people on that show, "How Clean is Your House," but it's still pretty bad. Well, things are looking up. Today my MIL bought us a brand new dishwasher for $30 at a garage sale. And a brand new garbage disposal for $20. Microsoft Windows is so annoying that a website, annoyances.org, is devoted entirely to helping people deal all the irritations of life with Windows. My current annoyance? When copying a whole bunch of files, why, oh why, does Windows stop copying if it encounters a file of the same name? I usually run into this with the Thumbs.db file. I might have 20 minutes left on the copy, so I leave the computer and expect Windows to be all done when I come back. But no! I return to find a prompt that is asking me if I want to replace the old file with the new one. Why can't Windows just set that file aside and continue copying? I now have 17 minutes left in the copy. An overwhelming percentage of you prefer fudgy brownies over cakelike. At least one person complained that she liked them neither fudgy nor cakelike, but what can I say? Brownie boxes rarely have instructions for anything other than cakelike or fudgy. You can see the fancy chart here. I walked into the kitchen, and on the ceiling above the sink, was an earwig. It's the first week of April, and there's a freaking earwig in my house. Last year I saw a few baby ones in May but didn't see any others until June. I wonder if this means a whole slew will be hatching from my keyboard any day now. It's 50 degrees outside. I'm opening windows!